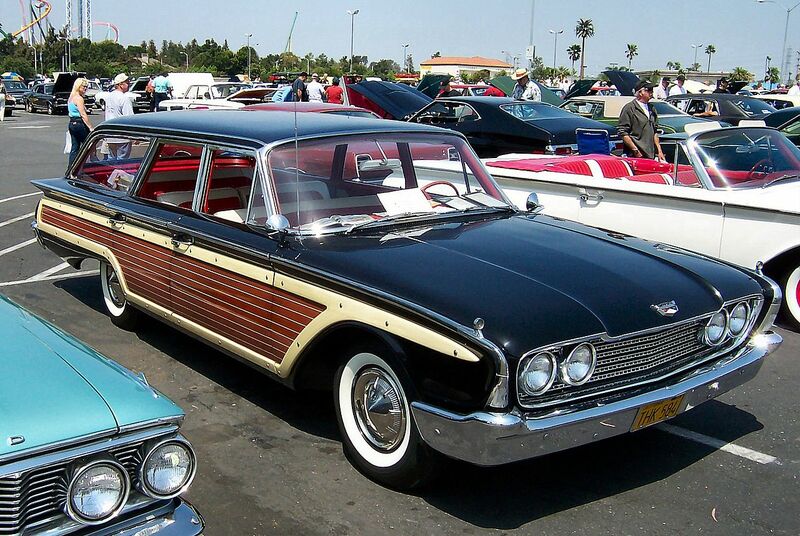 The Ford Country Squire is a full-size station wagon which was built by the Ford Motor Company in the United States from 1950 until 1991, encompassing seven model generations. It was the premium station wagon model in Ford’s full-size car range throughout this period. 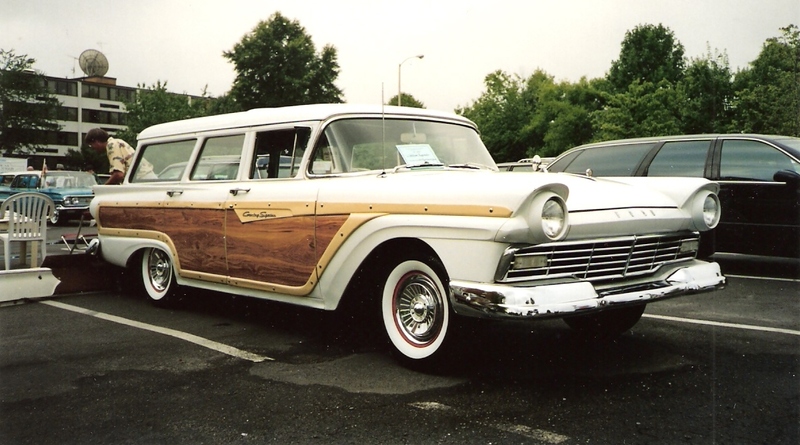 The Country Squire was initially built as a full “woodie“. After the mid-1950s the rear body was composed of fiberglass covered by a vinyl appliqué printed to simulate wood. 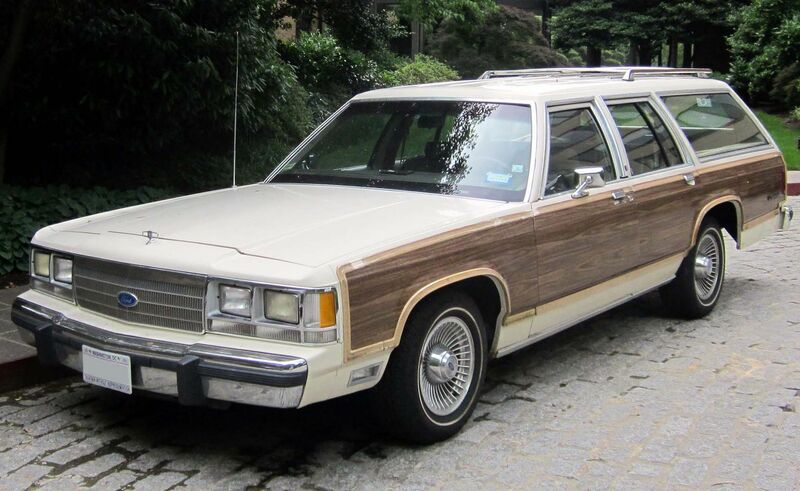 Later versions featured an all-steel body and are best remembered for featuring body sides and a tailgate covered by simulated wood trim and panels, however the Country Squire could be purchased without them. 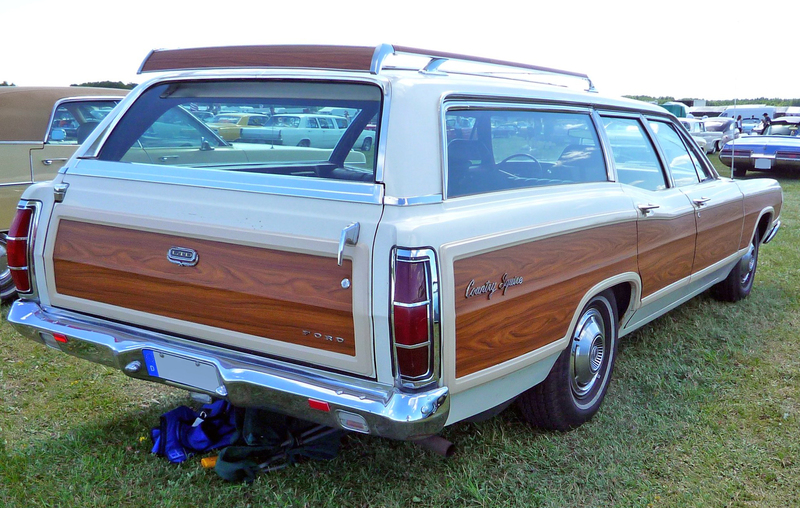 Prior to 1974, full-size Ford station wagon models without simulated wood trim were marketed as the Ranch Wagon, Del Rio, Parklane and Country Sedan. 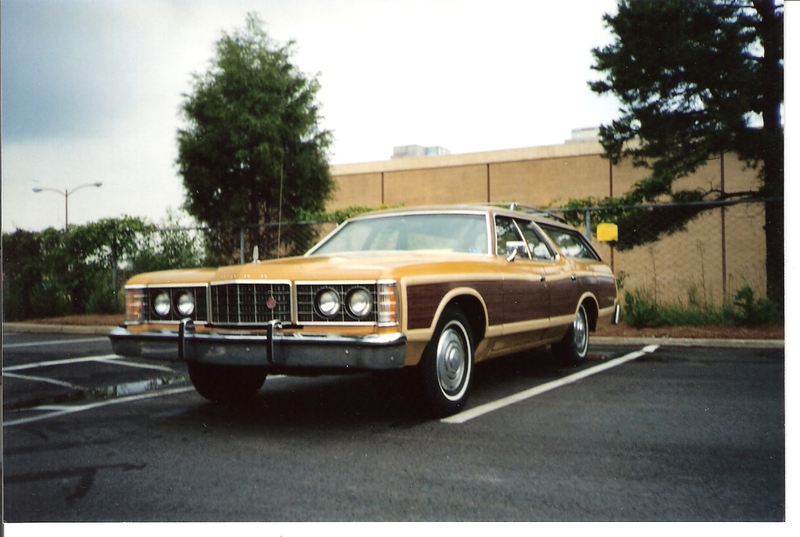 Subsequently, all full-size Ford wagons were marketed under the Ford LTD name, including the LTD Country Squire. The Country Squire was based on the Custom Deluxe series in 1950 & 1951, the Crestline from 1952 to 1954, the Fairlane from 1955 to 1958, the Galaxie from 1959 to 1966, and the LTD/LTD Crown Victoria from 1967 to 1991. Due to declining sales, Ford elected to exit the full-size station wagon market after 1991. The Mercury Colony Park was the equivalent model sold by Ford’s Mercury division from 1957 to 1991. The 1950 Ford model range included a station wagon which, at the time of its introduction, was marketed as part of the top-line Custom Deluxe trim. In the following spring, Ford began promoting the wagon as the Country Squire, although that name did not appear anywhere on the car. Along with the name change came the addition of a fold-down middle-row seat. Following the rest of the Ford lineup, the Country Squire was available with a standard 226 cid inline six-cylinder engine as or an optional V-8. 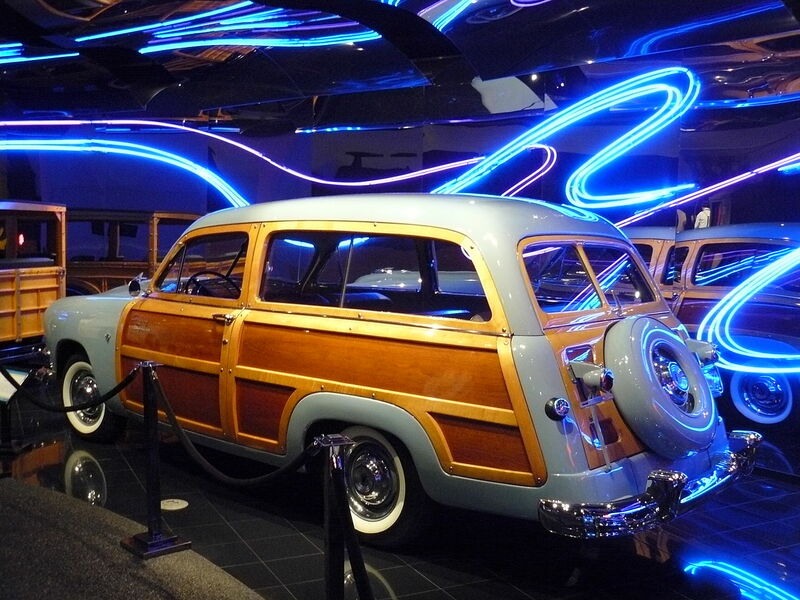 The first generation Country Squire was the beginning of the end of the full “woodie“. The whole body was made of steel, unlike the Ford wagons up to 1948 that were all wood from the cowl back except for the rear fenders. Real wood attached to the steel body on the doors, sides and tailgate of the 1949 thru 1951 models, and Ford did not offer a woodless version. The interiors were all paneled in wood also. GM would later introduce a two-door station wagon in 1955 called the Chevrolet Nomad and Pontiac Safari. In 1952, Ford expanded station wagons into a lineup separate from its newly redesigned sedans. The Country Squire was the top model, now available solely in a four-door configuration; it was the wagon counterpart of the Crestline series. Joining the Squire were the four-door Country Sedan (Customline) and the two-door Ranch Wagon (Mainline). The 239 Strato-Star V-8 was the only engine offered in the 1952 Country Squire. 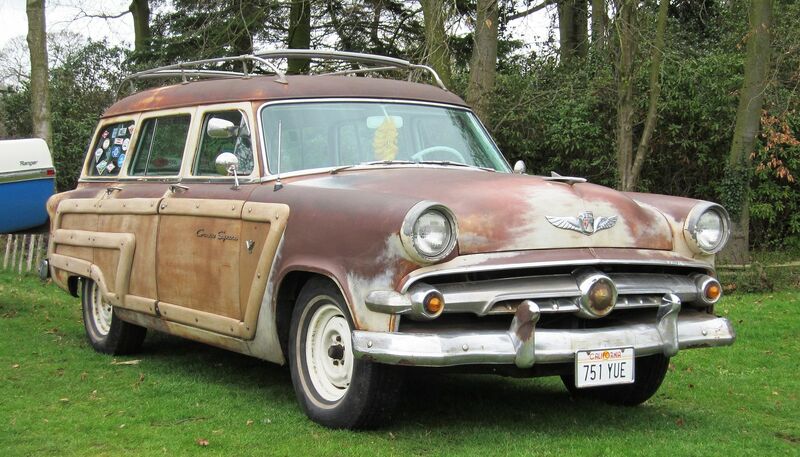 Unlike its predecessor, the 1952 Country Squire no longer was a true woodie; like the Country Sedan, it wore a full steel body. 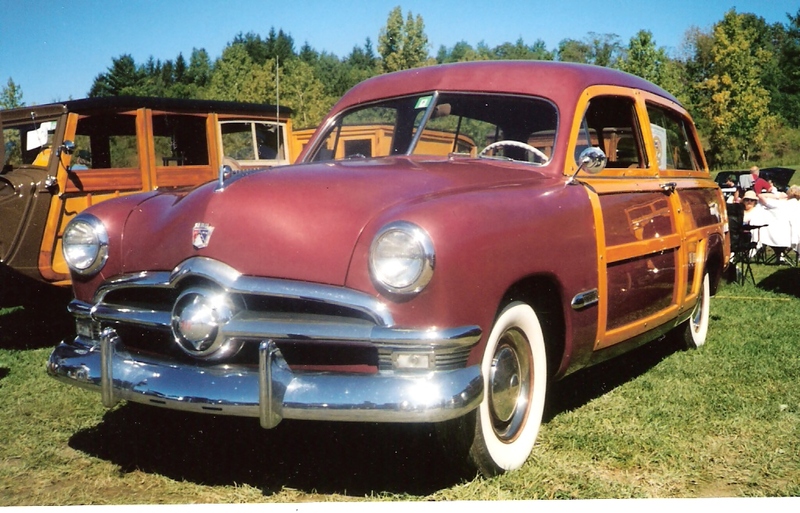 The woodgrain finish was now constructed by woodgrain transfers edged in real wood trim on the sides and tailgate.The real wood trim was discontinued half way thru the 1953 model run and replaced with fiberglass trim with a woodgrain finish. 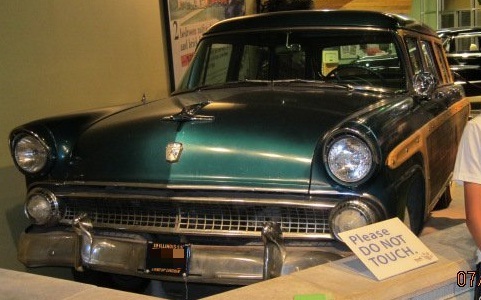 For the 1955 model year, Ford station wagons became a separate model range from the sedans, coupes, and convertibles. 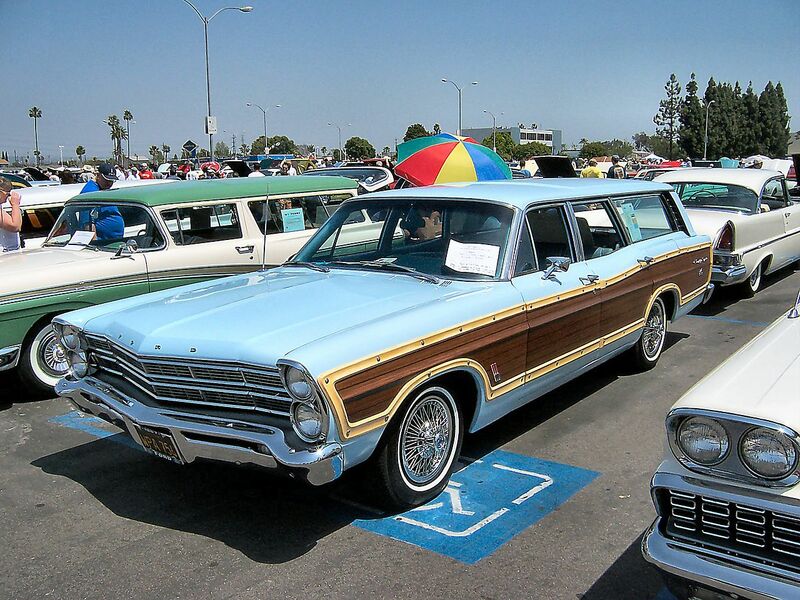 The woodgrained Country Squire was the top-of-the-line model, trimmed similar to the Fairlane. For the first time, all wood trim was simulated with vinyl decals. Sharing a common wheelbase with the rest of the Ford model line, the Country Squire saw little visible change from 1955 to 1956. For 1956, a 12-volt electrical system became standard equipment. The Lifeguard package became a new option for 1956, with few takers. For 1957, the Ford model line grew longer and lower as part of a major redesign; a major factor of the new chassis was the upcoming introduction of the Edsel line for 1958. The Country Squire body and interior would be used for the production of the non-woodgrain Edsel Villager and the top-trim Edsel Bermuda (distinguished by its combination of woodgrain sides and two-tone paint). For 1959, after only 2,235 were produced, the Edsel Bermuda was dropped, trimming the division’s range solely to the Villager. However, in a movement to stay competitive with other manufacturers, all 1959 Fords were lengthened; the wheelbase was increased from 116 to 118 inches. Following the change in the sedan line, the Country Squire was trimmed similar to the newly introduced Galaxie. In Australia, where the Ford model lineup began local production in 1959, the 1959 body style used for only one year in the US and Canada, the Country Sedan was sold until 1962. The Country Squire was never sold in Australia. This generation is referred to locally as “Tank Fords” because of their size (in comparison to the Ford Cortina sold at the same time). Prior to 1961, all Ford wagons used a two-piece tailgate assembly that required the operator to lift the rear window up and locking it into place via a mechanical support, and then drop the tail gate down to fully access the rear compartment. For 1961, Ford introduced a redesigned tailgate assembly using a self-storing window feature which could either be rolled down into the gate via crank on the outside of the gate, or by an electrical motor actuated by the key or an interior switch. A safety lockout measure required that the rear window had to be fully retracted into the tailgate before the tailgate could be lowered. In 1966, all Ford wagons introduced the Magic Doorgate, engineered by Donald N. Frey, which allowed the tailgate to flip down like a traditional tailgate or to open to the side as a swinging door. The Magic Doorgate was made possible through use of a traditional stationary hinge on the right, and combination of hinges along the door’s left side which carried the weight of the gate as it swung outward when used as a door. This generation introduced covered headlights, which were deployed using a vacuum canister system that kept the doors down when a vacuum condition existed in the lines, provided by the engine when it was running. If a loss of vacuum occurred, the doors would retract up so that the headlights were visible if the system should fail. For 1968, the Country Squire wore “LTD” lettering above the grille but was still marketed as the “Ford Country Squire”. 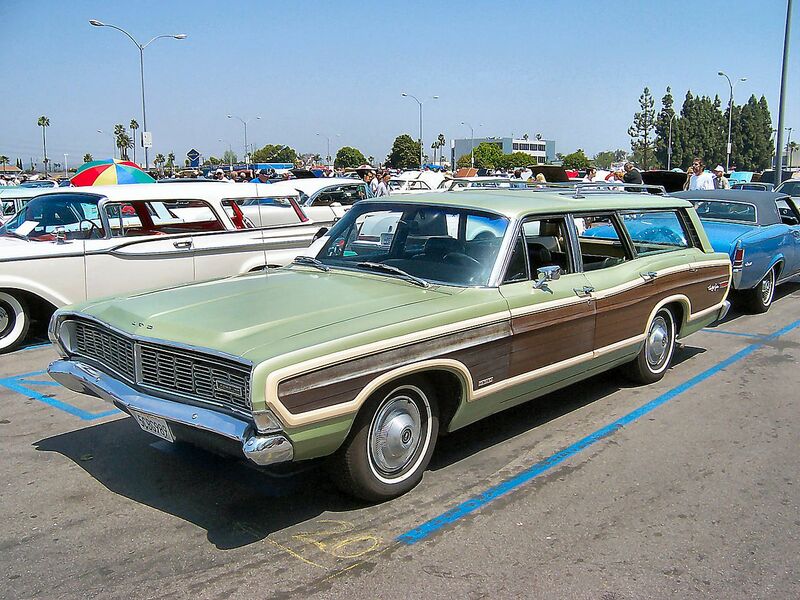 For the 1969 model year, Ford ended its practice of distinct model lines for station wagons and sedans. Alongside the Ranch Wagon and Country Sedan, the Country Squire were integrated into the three-model full-size Ford car lineup. Remaining at the top of the range, the Country Squire became part of the LTD lineup, gaining the prefix of that model. Approximately 7,850,000 full-size Fords and Mercurys were sold over 1969-78. This makes it the second best selling Ford automobile platform after the Ford Model T.
For the 1969 model year, a new generation of Ford and Mercury cars made their debut; station wagons for both divisions rode on a 121-inch wheelbase shared with the Ford sedan line, a gain of two inches. The “Magic Doorgate” tailgate was updated to a 3-way design: it could now swing down as a tailgate or swing out with the window down or up (the latter was previously not possible). 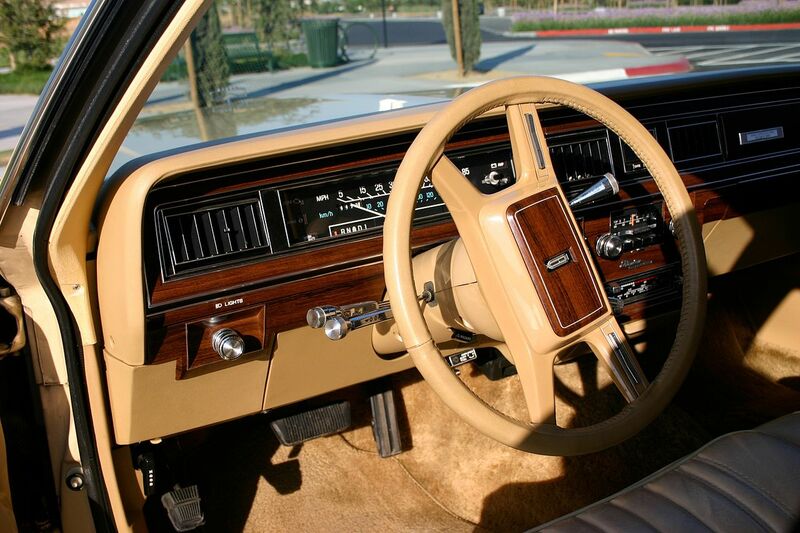 As part of the LTD line, the Country Squire wore similar interior trim; with the obvious exception of its simulated woodgrain paneling, Country Squires wore the same bodywork from the windshield forward as their LTD sedan counterparts. For the 1970 model year, visible changes were limited to detail changes in bumper and grille trim. In 1971, the Country Squire would be given an extensive facelift (with only the roof and tailgate carried over from the 1970 model); as with the LTD, it would lose its hidden headlamps in the grille. Initially, the standard engine was a 302 cubic-inch V8, replaced by a 351 cubic-inch V8 midway through the 1969 model year. As with its LTD counterpart, the 390 and 429 V8 engines were options. In 1971, the 390 V8 was replaced by a 402 cubic-inch V8 (though sold as a 400). . For a variety of reasons, 1972 saw a major decrease in powertrain output. That year, gross horsepower was replaced by SAE net horsepower. The addition of emissions controls and adoption of unleaded fuel required lowered compression ratios and retarded ignition timing. In one example, the range-topping 429 V8 would see its output drop from 365 hp to 212 hp from 1971 to 1972. In 1972, the 429 was joined by a 224-hp 460 cubic-inch V8 seen previously in the Lincoln lineup. For the 1973 model year, the Ford full-size car line was given a major update. While still built on the same chassis and 121-inch wheelbase, the addition of 5 mph bumpers would add over six inches in length to the LTD Country Squire by the end of the 1974 model year. These would also be the longest and heaviest station wagons ever produced by Ford. For 1974, 5-mph bumpers were added to the rear, a transistorized ignition system was introduced, as well as a new hood ornament. In addition, the 429 was dropped, largely replaced by the essentially identical 460 V8. 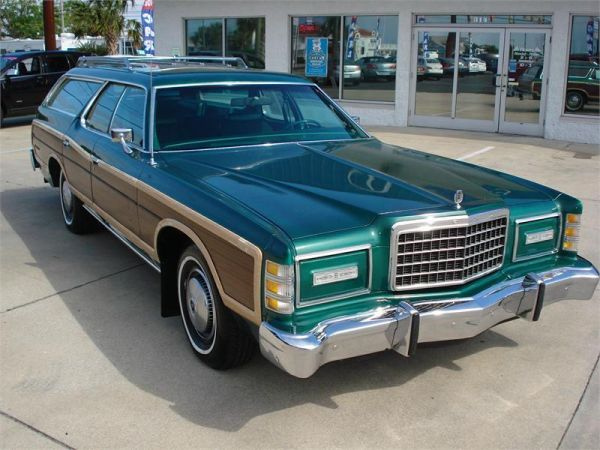 For 1975, Ford began to pare down its wagon lineup as the Custom 500 Ranch Wagon was relegated exclusively to fleet sales and the Galaxie Country Sedan was discontinued, replaced by a non-woodgrain LTD wagon. To better distinguish the LTD Country Squire, Ford returned hidden headlamps to the model, a feature associated with top-line LTD Landau (and Mercury Marquis) models. In all models, catalytic converters were now standard equipment to comply with emissions regulations. 1975-1978 models were nearly identical except for small differences in trim and emblems from year to year. 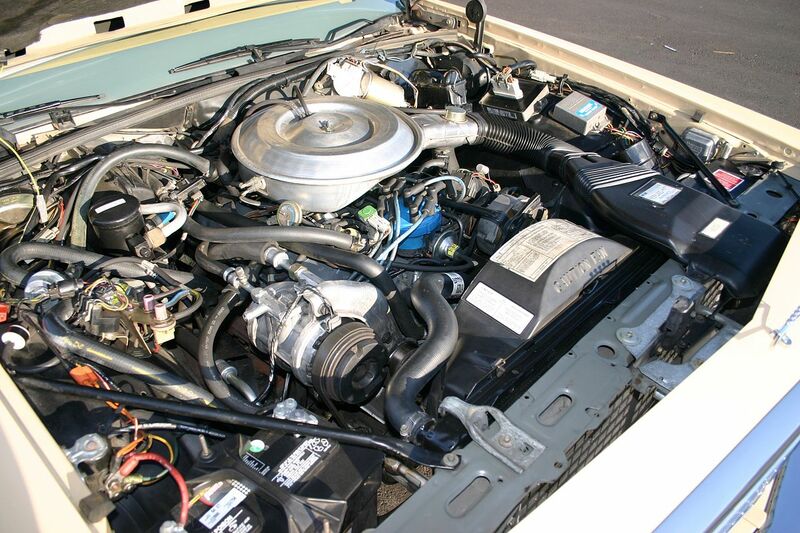 As a move to increase fuel economy, the 351 cubic-inch V8 was reintroduced for 1978. The standard engine on all other full-size Ford sedans and wagons was the 351 Windsor V8. The Country Squire however, came standard with the Cleveland 400M V8, while the 385-series 429 and 460 V8s were optional. With manual transmissions being dropped from the lineup, the C6 3-speed automatic transmission was now the only transmission option for full-size Fords. The 429 and 460 V8s were a common option due to the especially sluggish performance of the detuned 400 engine that was now struggling to drive the ever-increasing weight of a Country Squire. In 1979, Ford became the last American automaker to downsize its full-size car lines. While Chrysler would abandon its full-size wagons until the introduction of the Dodge Magnum in 2005, the LTD Country Squire would take on an entirely new form as the company responded to the introduction of the smaller Chevrolet Caprice and Pontiac Safari wagons. 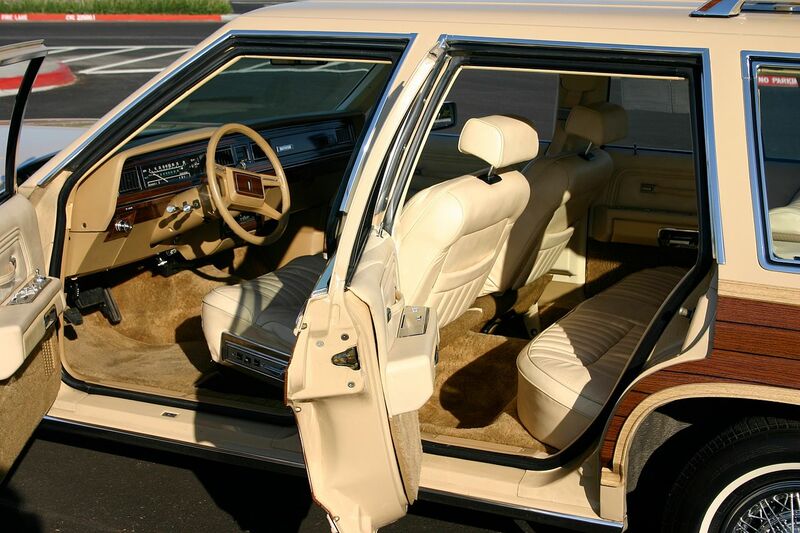 Eleven inches shorter and nearly 1000 pounds lighter than its 1978 predecessor, the redesigned Country Squire retained its 8-passenger seating capability with only slightly reduced cargo capacity. The big-block 400 and 460 cubic-inch V8s were not included in the redesign, leaving the Country Squire with the 302 cubic inches (4.95 l) and 351 cubic inches (5.75 l) Windsor V8 engines. The 1980s saw relatively few changes to the Country Squire. In 1983 the carbureted engine was replaced with throttle body fuel injection. 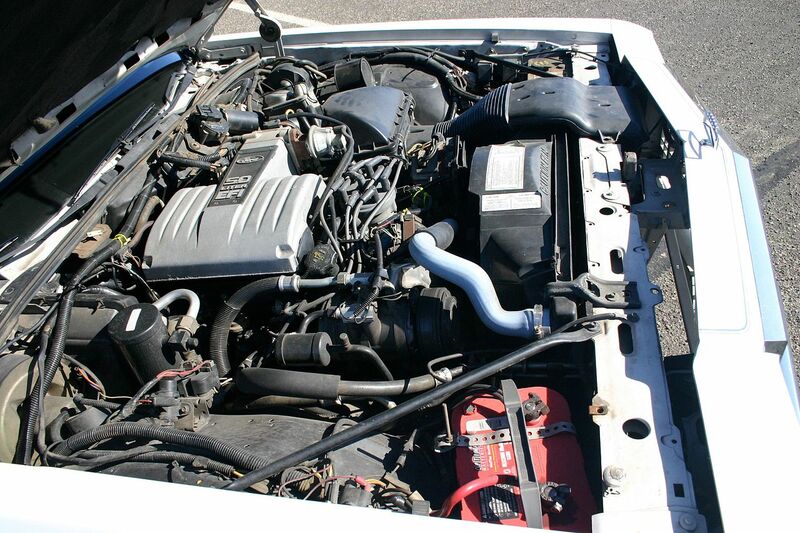 For the 1986 Model year, Ford went to sequential multi-port fuel injection which is identifiable by the large intake with the EFI 5.0 badge on top. In 1988, coinciding with the facelift of its LTD Crown Victoria counterpart, the Country Squire received a new front clip. Inside, new front seats with larger head restraints were added. 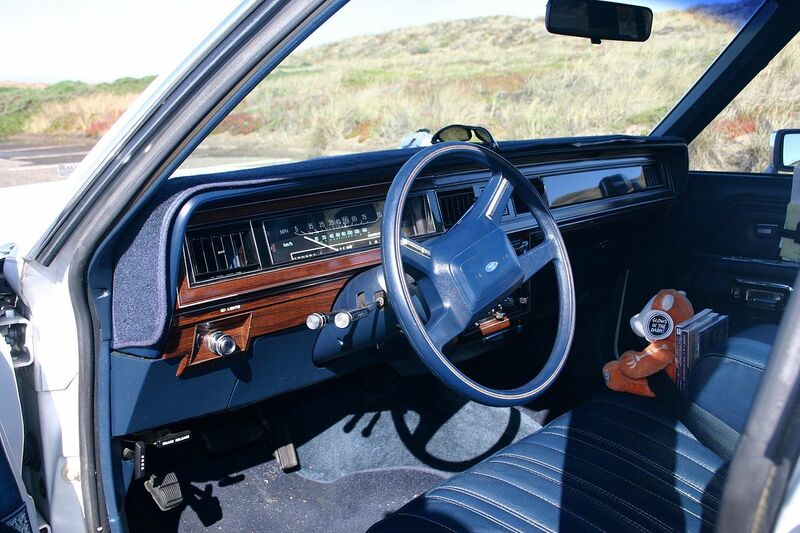 For 1990, the dashboard was updated (for the first time since 1979) with the addition of a driver’s side airbag; the outboard rear seats received 3-point seatbelts. After the mid-1980s introduction of minivans by Chrysler, Ford, and GM, sales of full-size station wagons began to decline. The primary reasons for the popularity of minivans were their superior cargo capacity and fuel economy despite taking up less garage space; by 1990, Ford’s Aerostar had overtaken all competitors in sales with the exception of the Chrysler minivans. 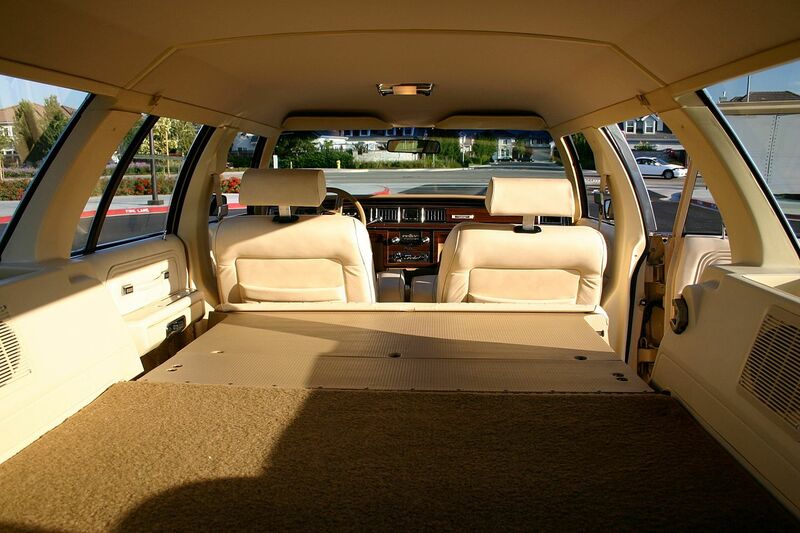 When Ford redesigned the Crown Victoria and Grand Marquis in 1992, the station wagon bodystyle was discontinued. While General Motors would produce station wagon versions of their redesigned 1991 full-size B-platform, they would sell relatively poorly, being dropped in favor of full-size SUV production. At Ford, the role of the 8-passenger station wagon was passed down to the Taurus, which was becoming the best-selling car in the United States; the role of the family towing vehicle was split between the Aerostar and the newly introduced 5-door Explorer. With certain versions of the Country Squire one could install an AM/FM-Cassette stereo with a combined and fully integrated Citizens’ Band (CB) two-way radio, and replacement dual-purpose automatic antenna (with only one visible difference that the aerial mast was a larger diameter, and black-band at approximately half-way up). The radio would then have the appearance of an original equipment, factory radio. Optional were opposing side-facing rear seats, which could be folded down to make a durable cargo surface. Available for use with the side-facing rear seats was a folding table with integrated magnetic checkers board. Magnets under the plastic checkers pieces would keep them from sliding on the board while the vehicle was in motion. Behind a rear fender well was a hidden, lockable compartment, not visible when the rear seat back was in the upright position. GM, Chrysler and AMC would adopt a similar configuration by the end of the 1960s. An advanced version of this was the 3-way tailgate which permitted opening the door sideways with the window up. 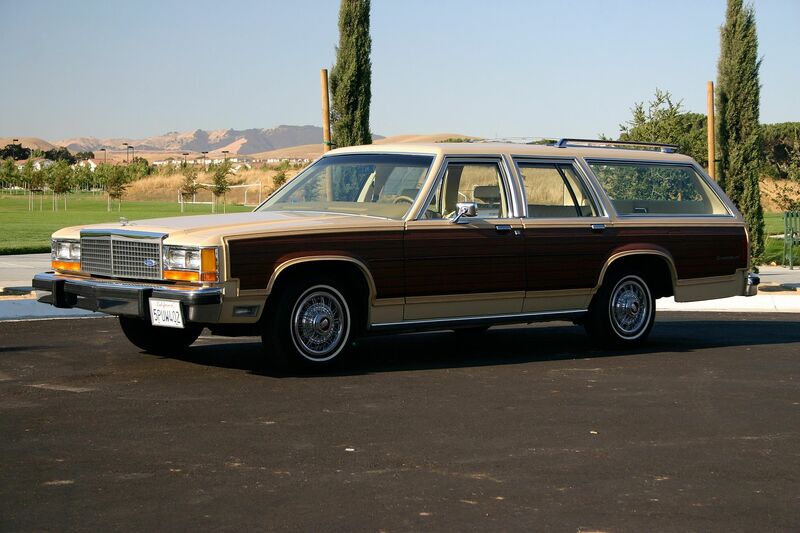 A red 1975 Country Squire is the main vehicle used by Peter Griffin in the animated sitcom Family Guy. The car at first did not share any resemblance to the Country Squire in earlier episodes, but after the show’s revival from a 2-year hiatus, the car went under a complete redesign to appear in its current form. A black 1959 Country Squire was used extensively in the 1967 movie Valley Of The Dolls. A red 1964 Country Squire was used to take James Bond for a ride in the movie Goldfinger. 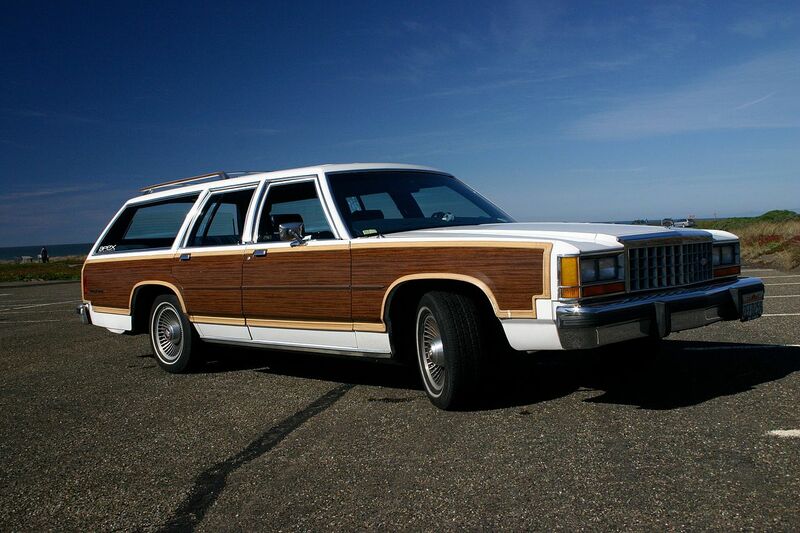 A heavily modified 1979 Country Squire Wagon was used by the Griswolds in National Lampoon’s Vacation. 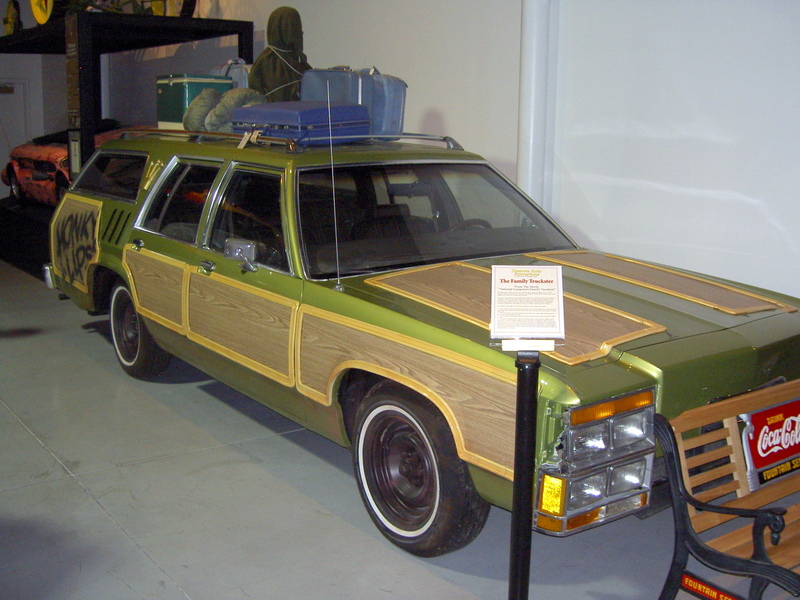 Branded as the Wagon Queen Family Truckster, it is meant as a parody of 1970s American vehicles and is largely destroyed on a cross-country road trip. A 1987 Country Squire is driven by the character Jason “Preacher” Rowe in the 1996 film Twister.